I hope everything is really good with you all ? I'm sure you might have seen if you follow me via Twitter that I really haven't been myself recently. I haven't been feeling very well since Christmas time, but finally I am in the process of getting things moving to try and work out what's wrong. I have been referred my by doctor for a scan, so I'm hoping for the best. I just wanted to say thank you to all my lovely readers/followers who have been tweeting me and messaging me the kindest messages! you definitely know how to perk a girl up ;) Anyway! I was contacted by the fabulous NEOM team about taking part in their #NeomStressLessChallenge and at this particular time it sounded like the perfect challenge. I have done a few NEOM related posts now, but hand on heart I can honestly say that NEOM are one of the most genuine brands I have ever come across. Everything about them is five star, from the luxury products to the bespoke customer service. I decided to get a little creative today and take my photography outside. Growing up in the countryside has taught me to really appreciate all things natural, and of course NEOM are a beautiful and very natural brand. I hope you enjoy today's post lovelies, and if there is anything I can help you with then don't hesitate to contact me via my social media icons. You are also more thank welcome to leave your thoughts and links in the comments section down below, as there is nothing more I love than hearing from my loyal readers! Stress is becoming an undeniable factor in modern day living, we are fitting more and more into our busy days and feeling the pressure. This April, NEOM is encouraging stressed-out individuals to take the ‘#NeomStressLessChallenge’, a programme designed to balance the emotions and soothe the soul. The challenge involves lighting all three wicks for around 2 hours to see if the calming properties really do work, it is also to be repeated throughout stressful periods. 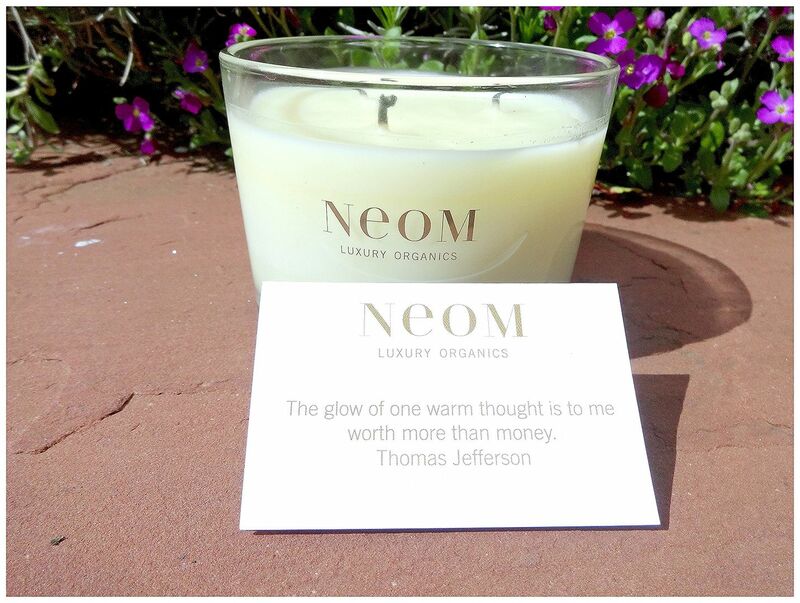 NEOM Luxury Organics candles are made using only vegetable wax and pure essential oils rather than synthetic fragrances so they burn without releasing harmful pollutants, toxins or soot. They work as powerful holistic treatments as you breathe in the scented air so it is best to burn them for between 2-4 hours at a time. 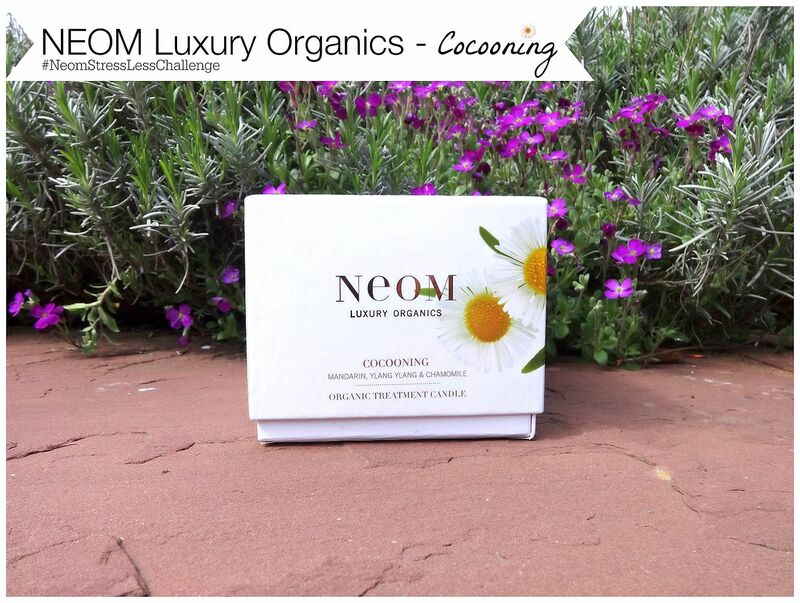 Nothing soothes my soul quite like a NEOM candle or bath product, so the thought of putting "Cocooning" to the test was quite exciting. The candle includes a luxurious blend of six key oils including, anxiety-reducing Roman chamomile, deeply relaxing jasmine and three citrus essential oils, mandarin, lemon and orange to combat blue feelings and even to boost moral. Like all other NEOM Candles the candle is housed in a simple but luxurious glass holder, which makes it very appealing to put anywhere around the house. The candle features three wicks which I personally love, and it looks so gorgeous burning on the side of my vanity. The main thing I notice about the scent is that it's very light and fruity, it definitely has comforting properties that don't weigh you down with deeper notes (check me out talking about fragrance notes haha). I find this candle just as uplifting as I do calming which is really nice, as it leaves me feeling comforted but happy at the same time. It also reminds me of when you feel really happy and cosy in bed, and just don't want to move (I'm sure a lot of my readers know this feeling). I think this candle would be suited to both day and night use, due to its mixture of calming and uplifting properties. The candle has an impressive burn time of 50 hours, so I'm looking forward to continuing to burn this beautiful candle over the next few weeks. Cocooning is definitely a new favourite of mine, especially as I'm going through quite a stressful period at the moment with my health. I have also read that this is a fantastic option for pregnant ladies due to its comforting, but inspiring properties. I have really enjoyed getting involved in the #NeomStressLessChallenge and have found that lighting this candle for 2 hours during stressful periods has really helped me relax. 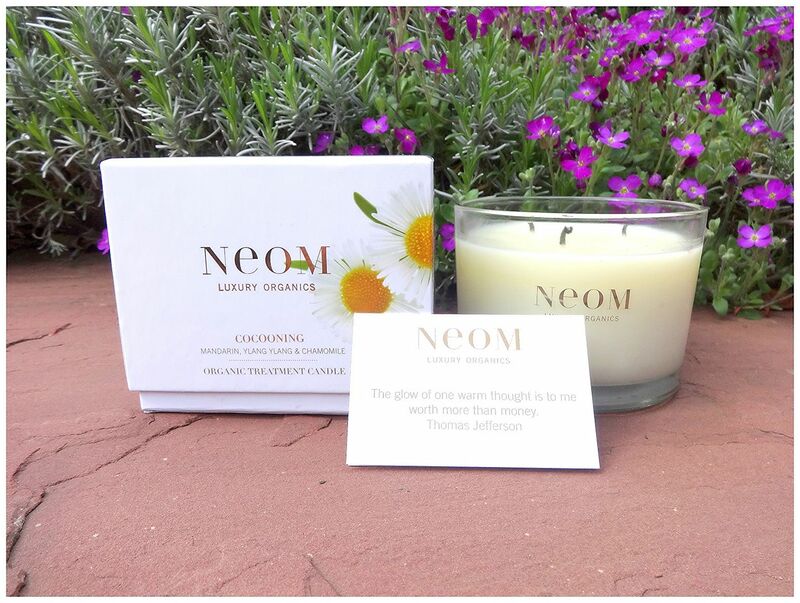 If your in need of a little TLC then you can buy the Cocooning Candle from the NEOM website for £39.50 - I hope you have enjoyed this post lovelies, and if you have tried or would like to try NEOM then I would love to hear from you down below. PS - Don't forget to check out NEOM'S April Stress Less Ezine it's an amazing read! I need that candle in my life! 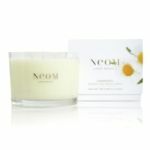 The Cocooning Candle sounds gorgeous, I really think I'd enjoy that, and I have never tried anything from NEOM. I've always wanted to try this candle and the brand looks amazing.